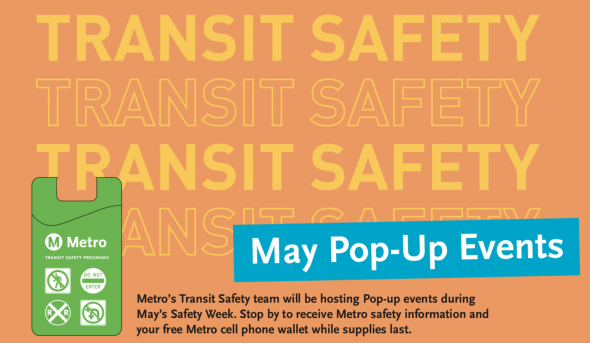 Metro’s Community Education team will be hosting several pop-up safety events at some of our busiest stations from May 7 through 11. Stop by one of our tables to receive safety information and a free Metro cell phone wallet case while supplies last! May 7: Union Station East & West Portal, 7 to 9 a.m.
May 8: 7th St/Metro Center Station, 7 to 9 a.m.
May 9: Pico Station, 11 a.m. to 1 p.m.
May 10: 7th St/Metro Center Station, 11 a.m. to 1 p.m.
May 11: Little Tokyo/Arts District, 7 to 9 a.m.
May 12: Union Station East & West Portal, 3 to 6 p.m.